1915. Studio portrait of 7768 Private (Pte) James Hoy McClenaghan, 1st Australian General Hospital, Australian Army Medical Corps (AAMC), of Sydney, NSW. A jeweller prior to enlistment, he embarked with the special reinforcements, 1st Australian General Hospital from Sydney aboard the HMAT Port Lincoln on 14 October 1915. 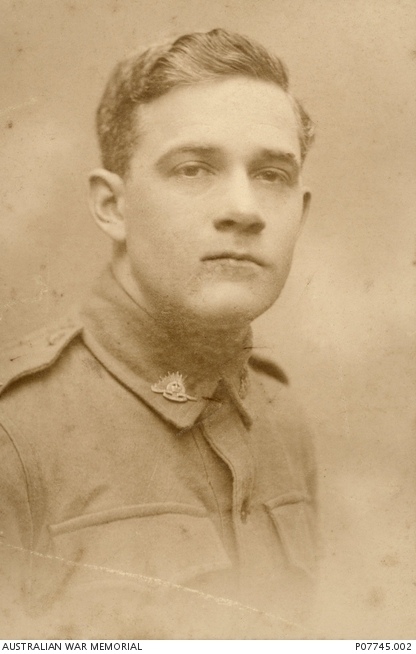 Pte McClenaghan was transferred to the 15th Australian Field Ambulance while serving in France in October 1916. In December 1916 he was admitted to hospital suffering from influenza, and spent the following six months recuperating in England before rejoining his unit in Belgium on 7 July 1917. Three days later, Pte McClenaghan was killed in action, aged 27, on 10 July 1917. He was buried at Hooge Crater Cemetery, Belgium.